Last night I was reminiscing to some friends of mine how when I was growing up (and perhaps more to the point WHERE I was growing up) you couldn't just go to the store to buy rap albums, and since there were no websites let alone anything called Amazon (you'd barely even recognize what we called "the internet" in my teens - it was 100% text based) you couldn't order it online. Downloading music? The idea of even downloading someone's picture was inconceivable, let alone an album, and much like websites MP3's didn't exist. No my friends, back in the late 1980's and early 1990's, if you wanted an album that stores around you wouldn't carry, you had only one reasonable option to solve your problem -- and that was called MAIL ORDER. In that era "The Humpty Dance" became a crossover hit which suddenly launched Digital Underground albums into mainstream retailers like Target and Walmart. Once I got hooked on D.U. in this manner though, I had to resort to mail order to get the artists affiliated with D.U. who released their own work. What store was going to carry Raw Fusion (Money B and DJ Fuze) or even "2Pacalypse Now" from 2Pac, who I was introduced to by D.U. 's "Same Song?" No one. I had to fill out an order form, sign a check, drop both in the mail... and wait. Once his cassette arrived though it was a revelation. 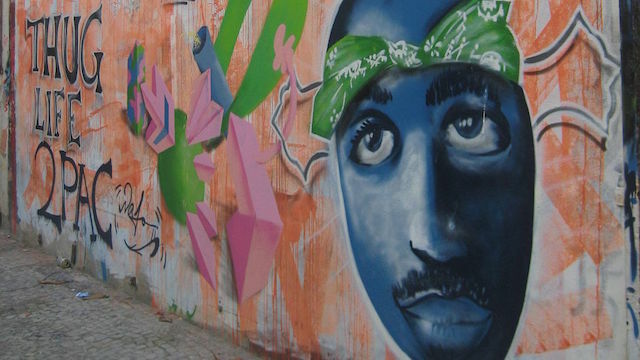 There was way more to Tupac Shakur than the man who used to clown around when he hung around with the Underground. It's still hard to fathom he was dead only five years later. This September marked the 20th anniversary of his tragic passing (9/13/96) so I'm memorializing him a little bit late, but that conversation about mail ordering tapes got me thinking about how excited I was as a kid to get that first 2Pac tape in the mail. So to kick off this 2Pac video retrospective, I'm going to start with one of my favorites to come off of that album. 1.) 2Pac - "If My Homie Calls"
2.) 2Pac - "Holla If Ya Hear Me"
3.) 2Pac - "Dear Mama"
4.) 2Pac & Snoop Dogg - "2 of Amerikaz Most Wanted"
5.) 2Pac - "Keep Ya Head Up"
6.) 2Pac & Dr. Dre - "California Love"
7.) 2Pac f/ Danny Boy - "I Ain't Mad at Cha"
8.) 2Pac - "To Live and Die in L.A."
9.) 2Pac - "So Many Tears"